Jassart learns the identity of his mysterious caller on Chapter 10, Page 6. 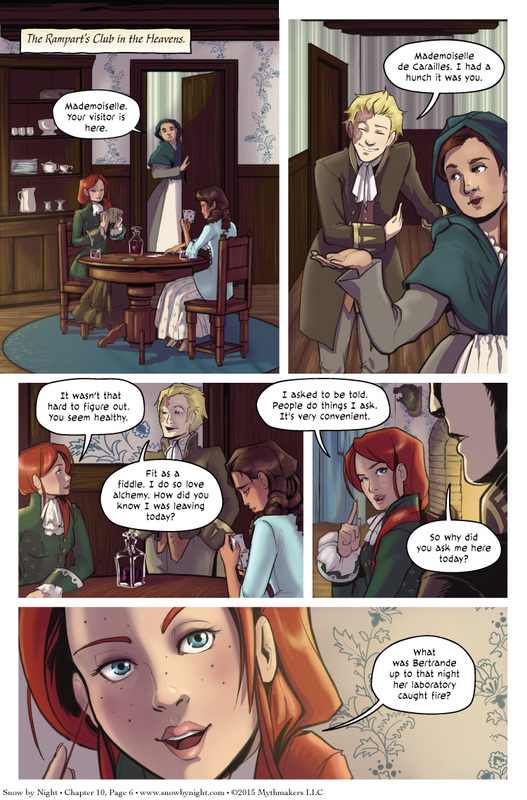 Vivienne has some questions after the last time she visited Jassart – well, one question in particular. It seems Jassart guessed that she might. To see Jacqueline’s opinion of Jassart, vote for Snow by Night on Top Web Comics for a sneak peek at the next page. Oh gods. NAIL HIM TO THE WALL!!! DO IT!!!!! Jassart is playing a dangerous game if he makes up a lie. Getting caught out lying to Vivienne de Carailles doesn’t strike me as the kind of thing one wants to risk. Nevertheless, I predict he will make up a lie all the same. Actually, I would expect him to tell her exactly what happened, but in such a way that makes him look like a hero, Bertrande look like an innocent victim, Snow look like a monster, and Blaise look like a dangerous psychotic. That is EXACTLY what I was thinking. He might very well tell all of it but twist it all up to win her favor. Image got corrupted in Dropbox. Fixed! oOOO, I LIKE her. She gets right to it! That last panel is beaaaautiful!